This mysterious sea serpent lurks in the deep, dark waters of the ocean. It seems to shift with the dark waves, its undulating body gliding through the water with ease. A mesmerizing sight, but one that is deceivingly graceful. Once it sets its eyes on prey, its speed increases until it resembles a whirl of coils in motion, disorienting its foe and creating a whirlpool that disrupts any chance of escape from all but the most deft of swimmers. As it chomps down with its massive teeth, it crushes prey instantly with its powerful flat-toothed jaws. Its intelligence is presently unknown - few get close enough to study this beast, as its actions are unpredictable and a swift. A crunching death is certain if one is not careful... but those with interest in these beasts believe it must have some significant wit considering its disorienting hunting tactics. 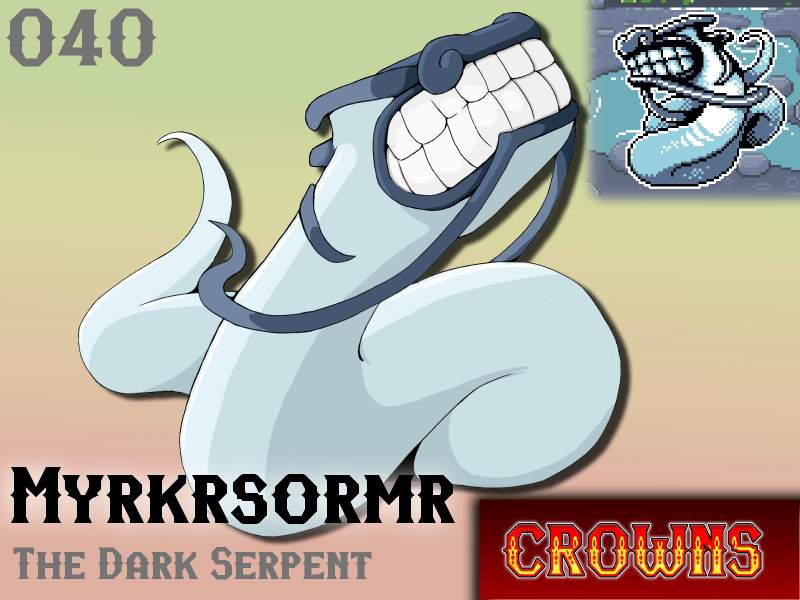 Will Myrkrsormr make your team?